This post was written by guest blogger Zev Lowe, VP of Growth and Impact at AtmaGo. Globally, disasters and humanitarian crises are on the rise. In the last 10 years, disasters have caused US$1.4 trillion in damage and affected 1.7 billion people. In the last two months alone, the United States has been hit by Hurricanes Michael and Florence, and Indonesia has been devastated by earthquakes and tsunamis. Technology can help us prepare for and recover from disasters. In fact, billions of people already have a powerful tool in their hands — mobile phones. With support from the Cisco Foundation, award-winning nonprofit Atma Connect has created AtmaGo, an app optimized for phones using low-bandwidth connections. AtmaGo has served over 1 million people in Indonesia, providing them with disaster alerts and allowing them to share information about roads and infrastructure, job fairs, entrepreneurship, and government services. An independently conducted study by the Centre for Innovation Policy and Governance (CIPG) in Indonesia reveals the three ways technology can help in a disaster. Even before the tsunami in Sulawesi or the earthquakes in Lombok, 79% of users found AtmaGo “very” and “extremely” helpful in connecting them with the community. AtmaGo users would regularly share information about road conditions, career and small business opportunities, as well as municipal services. The app allowed users to build trust and familiarity, so that those social ties existed when they needed them most. As a result, 68% of users report sharing posts from AtmaGo with an average of 28 other people, quickly and efficiently spreading news and information during emergencies. After natural disasters — from the 1995 heat wave in Chicago to the catastrophic 2011 tsunami in Japan to Hurricane Sandy that hit the Atlantic coast in 2012 — communities with robust social networks had lower mortality and bounced back more quickly from disaster. A study of over 180 municipalities in Japan showed that social ties, interaction, and shared norms created an environment where communities worked effectively to help each other as family, friends, and neighbors. By integrating emergency alerts into AtmaGo, the app increased the amount of critical and trusted information available to users. As a result of emergency alerts and related disaster recovery information, 93% of survey respondents moved valuable items, 83% evacuated, and 45% warned others in the face of certain catastrophe. In the quest towards building healthier and more resilient communities, AtmaGo adds a critical piece to the puzzle by providing users with actionable information to more easily evacuate, change their routes, and escape hazards such as flooding. The study calculates that using AtmaGo adds an estimated 643 years of healthy life per 100,000 people. While government bodies and non-governmental organizations (NGOs) strive to provide emergency assistance, it can take time to mobilize aid from outside the affected community. In emergencies, mobilizing and organizing from within the community can make a substantial difference. AtmaGo users turned to the platform to connect with others, offering to share their own resources. The 2018 tsunami in Sulawesi is estimated to have killed 2,256 people, injured another 4,612, and displaced 223,751 people from their homes. In the aftermath of that disaster, AtmaGo user Ella Naila offered her home as a makeshift command center for 50 humanitarian workers . 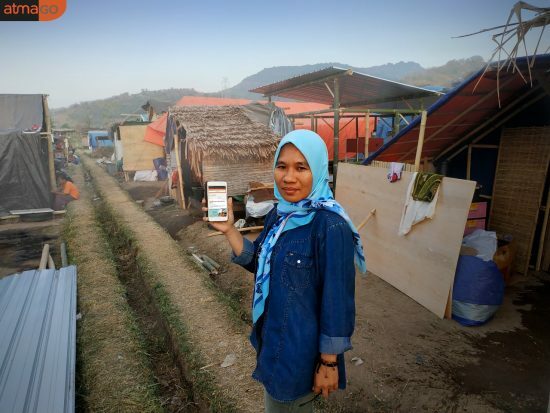 On the Indonesian island of Lombok, after a series of earthquakes in July 2018, a local resident named Sanisah started using AtmaGo to organize activities to help disaster victims, and to share the latest on community conditions. Ella Naila and Sanisah weren’t alone, though; 31% of users reported using AtmaGo to invite neighbors to pre- and post-disaster activities, such as clearing storm-water drains to reduce flooding. Ella Naila and Sanisah are just two examples of the strong female presence on AtmaGo. These women, and many others like them, build community before a disaster, and then step into action in the immediate aftermath. Given that women and children are 14 times more likely to die in a disaster than men, it is particularly important that any disaster relief and resilience effort center the needs of women. As a proud member of the United Nations Women’s Global Innovation Coalition for Change, Cisco is proud of these AtmaGo users who embody the powerful combination of women and technology. Daryn Kagan, a journalist, once said, “Bad things do happen in the world…but out of those situations always arise stories of ordinary people doing extraordinary things.” These ordinary people are AtmaGo users. It is now more possible than ever for ordinary people like these to use the tools at their disposal — like AtmaGo — to help them do extraordinary things to build a more resilient world. Share a link to the study or to this post on social media.